When Sir Walter Scott died in 1832 he was the most famous novelist the world had ever known. Remarkably, Scott took up fiction only in middle age, after abandoning narrative poetry when he found himself eclipsed by Byron’s mega-celebrity and greater poetic originality and vigour. Over a twenty-year long career as a novelist he achieved phenomenal popularity and esteem, producing some twenty-five novels and collections of tales. His first novel, Waverley, appeared anonymously in 1814, when he was 42 years old, and sold out six editions in its first year. Having established what was then an entirely new literary form, a hybrid of history and fiction, he wrote eight further novels set in Scotland and for the most part in the eighteenth century, and transformed attitudes to Scottish culture and history in the process. With the publication of Ivanhoe in 1820, where he was still identified on the title page only as “By the Author of Waverley &c.,” Scott began to adapt his historical fiction to other places and other periods, shifting with apparent ease from medieval England to the France of Louis XI to the Palestine of the Crusades. Seven years later, in 1827, he finally acknowledged publicly what many had guessed from the first. He was indeed the author of Waverley: the great unknown. But by that time Scott had written himself into the ground. Driven partly by the demands of his creditors (he was ruined by his business partners, and by his own profligate spending on his country house, Abbotsford), and partly by the demands of his readers, his output accelerated rapidly in the 1820s. As he wrote more and more quickly, churning out two three-volume novels in some years, he came to lean on his fluent style and practised facility with the fictionalisation of history. Despite the inevitable falling away of his powers under the stress of this literary production-line, Scott’s international popularity and reputation only increased through the 1820s, and showed no signs of going into decline after his death in 1832. For the next half-century he was a national literary icon, as revered as Shakespeare. But during the 1880s, just as historical fiction was being revived by a new generation of romancers—Andrew Lang, Robert Louis Stevenson, Conan Doyle and others—Scott suddenly “ceased to be popular with the reading public at large”. Stage dramatizations of his writing, of which there had been several thousand to that point, began to decline sharply in popularity. And by the beginning of the twentieth century Scott was once again just another of the great unknowns: a writer of “classics” whose name was familiar to almost everyone, but whose novels, although they were still widely available across the world, were no longer much read outside the schoolroom. Ironically, the vast new mass market created by the educational reforms of the 1870s had a limitless appetite for historical romance—by Stanley Weyman or Rafael Sabatini, Lew Wallace or Winston Churchill. The advent of cinema, we might suppose, held the promise of a reversal for Scott. Its potential as a medium for historical romance was very quickly recognised, and the Waverley novels seemed ready-made for the various historical genres that soon emerged, such as the costume drama, the period film, and the biopic. After all, Scott was the first writer really to visualise history, to see the past and its great figures vividly in action in brilliantly realized landscapes: his was a widescreen, technicolour history. Only in the earliest phase of the silent cinema, however, was that promise borne out. Between 1909 and 1914, fourteen Scott films were made in four different countries (the UK, USA, France, and Italy) from seven novels, one story, and a poem: still barely one-third of the number of films made from Dickens’s writing in the same period. Ivanhoe, which almost alone made Scott’s name known to later generations of moviegoers, was already the favourite, attracting three film versions. Interestingly, The Heart of Midlothian was made twice in 1914 (it was never filmed again: see below), as were two other novels that would prove appealing to subsequent filmmakers: The Bride of Lammermoor and Rob Roy. By contrast, between 1915 and the end of the silent era in 1930 Scott virtually disappeared from the cinema: only five more films were produced, from three novels (Rob Roy, The Talisman, and The Fair Maid of Perth). Thereafter, to the best of my knowledge not a single Scott film was made anywhere in the world between 1930 and the revival of interest in chivalric epic in Hollywood during the Cold War. This spurred a minor Scott revival, but only in Rob Roy and the handful of medieval swashbucklers: Ivanhoe, The Talisman, and Quentin Durward. Scott fared rather better on radio and television. Between 1940 and 1974, the BBC made ten radio serials,  and between 1957 and 1998, fifteen television serials (of eleven novels) appeared. Thus, the Scott cinema canon, which had been fairly eclectic in the early years of film, soon narrowed to just three principal source works: Rob Roy, Ivanhoe, and Quentin Durward. The small number of recent Scott films had continued this trend: most were made in post-Soviet Russia, and one, Rob Roy (USA, 1995), is only tangentially based on the original novel. Significantly, too, only Rob Roy had been a favourite with theatre-goers before the advent of cinema: there were some 970 stage adaptations of the novel produced in the century between 1817 and 1917, nearly four times as many as Ivanhoe and Quentin Durward combined. So why did one great Scotch romance and a couple of minor medieval romances assume such prominence in the cinema? The following section of this essay will consider some of the surviving film versions of these three novels, with particular attention to cinematic representations of Scotland. But that is only one side of the story of Scott’s influence on film. He is visible almost nowhere in the history of cinema (look up “Scott” in the indexes of most film histories and you’ll find Randolph and Ridley, but never Walter). But from another perspective Scott is arguably the greatest of the screen unknowns, for, paradoxically, no other single literary figure—not Shakespeare or Dickens—has been more significant in the evolution of film narrative. To substantiate that large claim, we must look first not at the cinema but at the broader directions of nineteenth-century prose fiction. Scott was the first modern popular novelist. He took the measure of the new markets for the novel in the nineteenth century, and showed that there was money to be made in mainstream popular novel-writing. He was also the first of the century’s great formal innovators, initiating the three-volume novel which shaped English fiction for the rest of the century. This is not to suggest that Scott would have done well out of the movies had he lived a century later, although there is undoubtedly something Beverley Hills about the legend of the laird of Abbotsford. Nor does it simply mean that, as the inventor and populariser of the historical novel, he originated a narrative mode that would, indirectly, come to have a tremendous impact on cinematic narrative. He also had a profound influence on those who did not think of themselves as historical romancers. if they … penetrated to the inner meaning of history … did so, too often, by overlooking the human content. The men of the past entered their story only indirectly, as the agents or victims of “progress”: they seldom appeared directly, in their own right, in their own social context, as the legitimate owners of their own autonomous centuries. The Civil War has its roots in “the ‘Romantic history’ school of Thomas Babington Macaulay, Augustin Thierry, and Jules Michelet”, which has its roots in Scott’s idea that historical crisis could be represented through the “sudden blaze of great yet simple heroism among artless, seemingly average children of the people.” For the same reason, perhaps, Woody Allen’s Zelig (1983) is the comic apotheosis of the Scott hero, at once historically imposing and absolutely mediocre, and the comic representative of a kind of history-making that was “false beyond measure, but—modern, true”, as Nietzsche described Scott. The Civil War, Zelig: the film age is an age of historical consciousness, into which Scott had been so completely absorbed—for “if [he] was not the “onlie begetter” of the genre, it was he who caused it to be taken up everywhere, from James Fenimore Cooper’s America to Aleksandr Pushkin’s Russia” —as to all but disappear. By 1900 his influence had reached so far that it would be almost impossible to trace the intricate crossed lines of descent from the Waverley novels to world cinema: via Alexandre Dumas to Errol Flynn and Douglas Fairbanks Jnr., via Fenimore Cooper to frontier films and the western; via Victor Hugo to the Disney Hunchback of Notre Dame (1996), via Lew Wallace to Cecil B. de Mille’s Ben-Hur (1959), via Alessandro Manzoni and Giuseppe di Lampedusa to Luchino Visconti’s The Leopard (1963); and via The Clansman to Griffith’s Birth of a Nation (1915); to Bernardo Bertolucci’s 1900 (1976), Rainer Werner Fassbinder’s The Marriage of Maria Braun (1979); to Gone with the Wind (1939) and Reds (1981); to Roberto Rossellini, Carlos Diegues, Steven Spielberg, Oliver Stone, and Akira Kurosawa. The list of films in which the great unknown became the great uncredited could go on and on. Looking forward to the release of the Disney production of Rob Roy, The Highland Rogue in March 1953, the London Times observed “how strange it is that more use has not already been made of Scott’s prolific work” in the movies. Rob Roy (1911) had in fact been the first British three-reel feature film to be made, and another version had been planned before World War II to star Michael Redgrave and Margaret Lockwood under the direction of Carol Reed. If there was generally little interest in Scott before the 1950s, the Times piece had, however, appeared in the middle of a mini-boom. Disney were keen to emulate the box-office success of MGM’s 1952 Sir Walter Scott’s Ivanhoe, and compete with the imminent Warner Brothers version of The Talisman, retitled King Richard and the Crusaders (1954) and the planned MGM Adventures of Quentin Durward (1955). Rob Roy, The Highland Rogue is not a version of Scott’s Rob Roy, however, and Disney—perhaps taking alarm at the Times’s assumption that it was a Scott adaptation—went to considerable lengths in the autumn pre-publicity to ensure that an action picture like The Highland Rogue would not be mistaken for the sedate, not to say slow-moving, classic novel. In response, several newspapers dutifully passed on the publicity, reporting that the film had nothing to do with Scott and was “founded entirely on history and legend.” To make the point absolutely clear, the screenwriters incorporated a central scene into the film in which the putative source of their story—a pamphlet called The Highland Rogue, then believed to have been written by Daniel Defoe (and actually written later, in 1723 )—is shown selling out to eager Londoners and being read by everyone from the Hanoverian King George I down. There is a wonderful irony in Disney advertising everyone but the antiquarian Scott in “this scholarly insistence on history” and its obscure sources for their “innocent Technicolor charade”. Moreover, despite Disney’s insistence, the Waverley Rob Roy was not in fact altogether overlooked as a source for the film. The legendary history of Red Robert Macgregor is told at some length in the novel, or at least in the “Author’s Introduction” to the novel, which, like the many other paratextual elements in the Waverley novels (prefaces, footnotes, appendices and so on), is vital to its overall meaning. Scott’s central interest lies in the figure of Rob Roy only in so far as his activities affect the fortunes of the fictional Osbaldistone family during the period leading up to the 1715 rebellion. Yet the Times reviewer, writing on the film’s release in October 1953, would have none of the Disney publicity, quoting at length the passage early in Scott’s “Introduction” in which he describes Rob Roy’s fame as being attributable in great measure to his residing on the very verge of the Highlands, and playing such pranks in the beginning of the 18th century, as are usually ascribed to Robin Hood in the middle ages—and that within forty miles of Glasgow, a great commercial city, the seat of a learned university. Thus a character like his, blending the wild virtues, the subtle policy, and unrestrained licence of an American Indian, was flourishing in Scotland during the Augustan age of Queen Anne and George I.
Scott’s reinvention of Rob Roy as a highland Robin Hood conveniently supplied Disney with a link between the Jacobite setting of the novel and the more congenial medieval Scott of Ivanhoe, The Talisman, and Quentin Durward. Conscious of the catastrophe of Alexander Korda’s Bonnie Prince Charlie in 1948, Hollywood studios were anxious to find ways of exploiting the magnificent Scottish scenery and the action, colour, and revelry of Scots “tartanry” without having to deal with the dramatically unpromising facts of the failed rebellions of 1715 and 1745 and the integration of Scotland into the United Kingdom. The Highland Rogue therefore belongs more compellingly with other chivalric romances coming out of the British-American co-productions of the period, such as another Jacobite makeover of 1953, Warners’ film of Robert Louis Stevenson’s The Master of Ballantrae, in which the presence of Errol Flynn inevitably calls up Robin Hood. 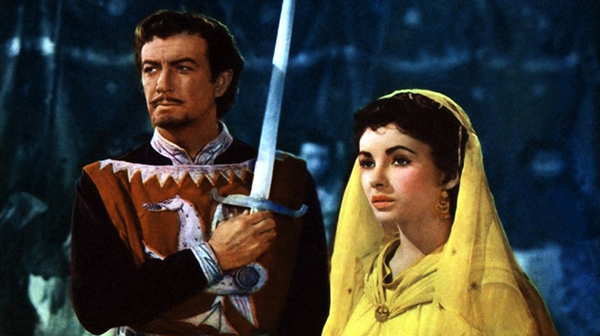 As Ivanhoe amply shows, Scott’s medieval romances came into their own in the 1950s because they were made to speak strongly to contemporary concerns. The post-war and Cold War years encouraged the consolidation of the cultures of the West, and the plots of Ivanhoe and Quentin Durward both “project … incipient nation states [or NATO states? ], not as culturally unitary but as divided against themselves.” These plots can be resolved only by symbolic marriages. Both stories offer domestic solutions to world-historical problems, therefore, and must have appealed to producers during the baby-boom of the 1950s when the American dream, projected as suburban domesticity and consumer culture, was being sold abroad as the most powerful weapon against Communist Russia. As critics have shown, too, Ivanhoe in particular showed how the camouflage of costume might allow a more critical examination of Cold War America. For example, Elizabeth Taylor’s lead role as Rebecca, the able, energetic Jewess who falls in love with Ivanhoe but must relinquish him in the end to the insipid Anglo-Saxon Rowena, raises issues about the role of women, the prevalence of anti-Semitism, and the spectre of McCarthyism in the 1950s. Scott’s aim in these medieval romances was to show how the great nation states, England and France, had once been divided against themselves but ultimately united to form new, stronger national identities. Ivanhoe compresses into its action-packed plot a long process of nation formation: the Normanization of the Anglo-Saxons and corresponding Anglicization of the Normans, in which a politically dominant feudal society and civilization enriches and is enriched by the integrity and vigour of a politically dominated ancient serfdom. For Scott, historical consciousness was the foundation of a stable society. The medieval settings allowed him to present models for a united Britain invigorated by the highland spirit, in which blood attachments have been subordinated to national attachments, and the Jacobite war of resistance, like the Saxon and Burgundian wars of resistance before it, has given way to an enlightened nationhood. The movie business had no interest in this Tory narrative of slow, organic national assimilation, however, and Rob Roy, The Highland Rogue, like Michael Caton-Jones’s later Rob Roy (1995) and the nationalistic blockbuster about the medieval highland warrior William Wallace, Braveheart (1995), appropriates the Scottish struggle to its own project, which has little or nothing to do with Scotland. This is just another Robin Hood story, a fable of the (essentially noble) highlander—wily, good humoured, and above all manly—taking it up to the powerful and corrupt local aristocracy (Montrose and Argyll) and winning favour with the monarchy as a result. Predictably, then, the English populace in The Highland Rogue, who might be expected to fear Richard Todd’s Rob Roy as a Scots bandit and freedom-fighter, instead enthusiastically identify with him. He is depicted as a generic champion of the oppressed: a legend of broadsheet ballads and pamphlets, a rascal who tweaks the noses of effete aristocrats and entertains the whole nation with his plucky exploits and daring escapes. No political dissident, no enemy of the state, no representative of Scottish resistance to incorporation: The Highland Rogue is only incidentally Scottish. The remarked resemblance between the highlanders and the American Indians in Scott’s “Author’s Introduction” to Rob Roy is pertinent here, for it suggests just how far from Scotland Rob Roy has wandered since Frank Osbaldistone ventured north. Indeed, The Highland Rogue was described by its director, Harold French, as “a Western in kilts”. There is nothing especially strange in this: in certain respects the Western genre echoes that “strong contrast betwixt the civilized and cultivated mode of life on the one side of the Highland line, and the wild and lawless adventures … [of those] who dwelt on the opposite side.” But where in Scott’s fiction the consolidation of the nation turns on the rescue of women by men, in the Western that plot serves the consolidation of an individualistic frontier ethos. Rob Roy, The Highland Rogue celebrates that ethos as surely as a formula Western. It is neither as sophisticated nor as careworn as its contemporary “A” Westerns, however, which were all exploring the darker implications of the pressure on democratic institutions in McCathyist America. Rather, as a number of critics have observed of this and other costume films of the 1950s, it was trying to appropriate the lush, highly feminised worlds of costume melodramas (epitomised by the Gainsborough pictures of the 1940s ) for displays of hyper-masculine individualism that were more familiar in the lesser Technicolour Westerns of the decade, which “presented plenty of slick, fast-paced action,” and the newly recycled “B” Westerns turning up on television. The battle scenes, chases, shoot-outs, and coach hold-ups all invoke the conventions of the “B” Western, and Richard Todd’s Rob Roy is no melancholy gunslinger like Gary Cooper or Alan Ladd. He reaches for his pistol, jumps across ravines, and escapes down waterfalls with all the energy of Randolph Scott or Hopalong Cassidy. Part medieval romance, part tartan Western, part classic novel adaptation, it is little wonder that Rob Roy, The Highland Rogue generated “so much confusion as to whose and what the story really is.” Some of the same issues arise in Caton-Jones’s Rob Roy, which reorients the material in Scott’s “Author’s Introduction” to contemporary concerns and borrows other scenes (such as the escape down the river) directly from The Highland Rogue. Once again, the (now sensitively manly) Rob is a proto-American. The film repeats Scott’s remark about American Indians and amplifies the connection in a thematic strand dealing with the promise of new world emigration to Virginia. The film’s scriptwriter, Alan Sharp, wrote a number of Westerns, and in this script he constructs Liam Neeson’s softly spoken Rob Roy as a Western hero of the Gary Cooper-Alan Ladd type. Like Richard Todd’s Rob Roy, he is, too, less a representative of Scottish resistance than a generalized Romantic individualism. He is the principled man who stands head and shoulders above the politics of Jacobites and Hanoverians, and who is misused by the corrupt and effete Montrose. He may be defeated, but, as the opening description of him attests, he maintains “respect and Honour” even in defeat. The historical Scotland of Montrose and Archie Cunningham is represented as the decadent Scotland out of which, and against which, the new world was formed. Disney had to abjure Scott’s Rob Roy and provide a counter-source of their own, “The Highland Rogue”, not because they didn’t own the rights to the Scott novel—although they may well not have —but because Scott’s novel tells an unacceptable story of failure. The 1995 Rob Roy and the contemporaneous Braveheart deal with this by presenting a mythic narrative of glorious failure, ignoring once again what they owe to Scott: a view of history that contests such triumphal American action genres by showing the ultimate ineffectualness of action itself. Paradoxically, the other major Scottish film genre in which Scott is an important influence makes a comic virtue of the consequences of the failed rebellions and the fact of Scottish powerlessness. That genre may be described as “the kailyard film,” which depicts another corner of the mythic geography of pre-modernity where the landscapes of the lochs and glens form a less sublime backdrop to a primitive, homely domesticity viewed nostalgically through the eyes of a returning native: the educated outsider looking on. This place would become familiar under many names in fiction, film, and television, among them Thrums, Drumtochty, Todday, Brigadoon, Glen Bogle, and Ferness Bay. It was, during its heyday, what “Scotland” came to mean in the popular imagination in Britain and across the world. It is customary to view kailyard stories as debased national narratives, myths of “an ideal national space” contrasted with “the outside world of degenerate city life.” In this respect they are gentle, easy-going, but still canny counterparts of the more potent “tartan” myths of the romantic and noble Highlander associated with the Jacobite Rebellion and the novels of Scott. They are also descendants of the Waverley novels. They exploited, as Scott did, the paradox of a people “living in a civilized age and country” who retained a strong “tincture of manners belonging to an early period of society” and “who are the last to feel the influence of that general polish which assimilates to each other the manners of different nations.” In effect, kailyard novels recycled in a very diluted form Scott’s fables of belated modernity. For Scott, Scottish language and culture represented the one remaining genuine national spirit in a world where nations had become much like each other. For the kailyard novelists, writing at the turn of the twentieth century, Scotland was recast as a lost world, a strange survival from pre-modernity calculated to satisfy, as other contemporary lost world romances did, the tastes of readers from widely different nations who had truly, by then, become assimilated to each other via the mass market. What happened to Scott’s idea of history in the course of that century? Kailyard transfers into comedy that “tragic sense” in Scott that is effectively unfilmable: that sense “of the inevitability of drab but necessary progress, a sense of the impotence of the traditional kind of heroism, a passionately regretful awareness of the fact that the Good Old Cause was lost forever and the glory of Scotland must give way to her interest.” Scott was, as David Daiches argued, both “prudent Briton and passionate Scot,” whose plots, as Lukács found, invariably end in “English compromise.” It has been argued that historical romance is “a field in which perceived contradictions in history can be recreated and resolved.” Yet in the case of Scott, a Tory in post-Revolutionary Europe, it might be truer to say that the function of his historical romance is to offer an evidentiary history of the efficacy of resolution and accommodation: of the historical processes of treaty and its compromises, in the overriding interests of social harmony. By the time kailyard arrives, generations of compromise have produced a sclerotic culture, where history has been altogether suspended, “becalmed,” and where one-dimensional representations in fiction (and, imminently, film) take over the work of asserting Scottish identity in the face of a dominant Britishness. They are, it is often remarked, a characteristic product of a culture of defeat and dependency that goes back to the failure of the Glorious ’45. Mildly insurrectionary, these idylls represent a happy medium, a compliant resistance. Can this diminutive lowland form, with its sly assertions of independence and cultural sovereignty, really be the logical extension of Scott’s glorious highland mythos, even supposing, as some have conjectured, he would have been delighted by its “faithful portrait of Scottish manners”? It is true, as Ian Duncan and other critics have shown, that kailyard can be traced back to the fourth volume of The Heart of Midlothian where Scott’s “ ‘fable of national regeneration’ ends up, in fact, turning away from the political idea of the nation and concentrating upon the domestic and moral economy of a private estate whose virtue consists in its seclusion from a hopelessly chaotic external world.” But it should be remembered that kailyard was not selling its domesticated fables of national regeneration exclusively or even chiefly to the Scots, neither in its earliest form, as popular fiction, nor in the runaway successes of the kailyard-inspired cinema. Rather, it satisfied a longing common to many readers and viewers for an end to history. These were tales of a generalised, mythic “national type”—a remnant species of the Romantic volk—which functioned as a fantasy substitute for a politicizing and internationalizing urban proletariat for whom national identity was secondary. At the same time kailyard returned to the characteristic topos of the Romantic national tale—the local community, the domestic space—in order to present a myth of localized pre-industrial culture for readers experiencing an unrestrained international expansion of capital and military power. Thus, kailyard, while symptomatic of the displacement of Scottish culture from history, was also symptomatic of cultural crises beyond Scotland. In a sense, kailyard was never really about Scotland, but about the triumph of small-town values over powerful outside interests. Nor, for that matter, were the reborn myths of tartanry in the cinema age really about Scotland’s disengagement from the realities of the modern world or its “retreat into a nostalgic mythic past.” Tartanry functions, as kailyard does, as an essentially American myth about the small guy: the underdog struggling and overcoming powerful and corrupt forces. Scott was probably the most influential disseminator of the “fake history” that Hollywood and Ealing and Shepperton Studios exploited so successfully in such films as Brigadoon (1955) and Geordie (1954), and which remains so influential in Braveheart (1995) and Rob Roy (1995). A scene in Murray Grigor’s irreverent and funny 1982 documentary Scotch Myths depicts him at his desk literally inventing tradition as he makes up names for a tartan. In truth, though, while Scott is constantly put up as an icon of highland “fakelore” in the twentieth century, few of his Scottish stories were either read or adapted to the screen. That is surely proof that if modern Scotland is a “stateless nation, an internal colony within the British state which clings precariously to its “difference” from England”, that difference was, largely, produced neither by nor for the Scots themselves in the film age. The movies could have no interest in the real meanings of Scott’s Scotland, only in their caricature in the cinematic tartanry of a highlands culture he was accused of inventing. As well as this, between 1813 and 1832 he produced numerous editions and anthologies, and works of history, biography, and criticism. John O. Hayden, Scott: The Critical Heritage (London: Routledge and Kegan Paul, 1970) 3. They are Old Mortality, The Heart of Midlothian, Rob Roy, The Bride of Lammermoor, A Legend of Montrose, and Redgauntlet. Of the two remaining Scotch romances, The Antiquary was set in Scott’s own time, and Guy Mannering in the days of his youth. Jane Austen, for example, was well aware who wrote Waverley: “Walter Scott has no business to write novels, especially good ones. —It is not fair. He has Fame and Profit enough as a Poet, and should not be taking the bread out of other people’s mouths.— I do not like him, and do not mean to like Waverley if I can help it—but fear I must” (28 September 1814). Jane Austen’s Letters to her Sister Cassandra and Others, ed. R.W. Chapman, 2nd ed. (London: Oxford University Press, 1964), 404. The title of Edgar Johnson’s 1970 biography reflects the widespread use of the nickname: Johnson, Edgar. Sir Walter Scott: The Great Unknown. 2 vols. (New York: Macmillan, 1970). Hayden, Scott: The Critical Heritage 2. Leslie Stephen had marked “the decay of interest in Scott” as early as 1871, the year of the Scott centenary (Critical Heritage 441), and “by the beginning of [the twentieth] century, Scott was not only largely unread, but simply dismissed by the British reading public” David D Brown, Walter Scott and the Historical Imagination (London: Routledge & Kegan Paul, 1979) 1. Cf. Richard Maxwell: “Between 1830 and 1930, the Waverley novels were omnipresent.” “Inundations of Time: A Definition of Scott’s Originality,” ELH (Vol. 68, Issue 2, 2001, pp. 419-68) 419. In H. Philip Bolton, Scott Dramatized (London: Mansell, 1992), the last dated stage adaptations of Scott, excluding operas and school playscripts, are: Marmion in 1903, Waverley in 1871 (54), Guy Mannering in 1913 (139), The Antiquary in 1844 (146), Old Mortality in 1874 (156), The Black Dwarf in 1833 (161), Rob Roy in 1990 (257), Heart of Mid-Lothian in 1949 (296), Bride of Lammermoor in 1908 (332), The Legend of Montrose in 1868 (340), Ivanhoe in 1914 (371), The Monastery in 1883 (374), The Abbot in 1886 (392), Kenilworth in 1905 (420), The Pirate in 1844 (425), The Fortunes of Nigel in 1903 (435), Peveril of the Peak in 1877 (440), Quentin Durward in 1940 (451), St. Ronan”s Well in 1893 (455-6), Redgauntlet in 1872 (461), The Betrothed in 1829 (462), The Talisman in 1938 (472), Woodstock in 1913 (476), The Fair Maid of Perth in 1967 (492), and Anne of Geierstein in 1829 (493). For their enormous popularity in Australia, for example, see The Australian Common Reader database (www.australiancommonreader.com). The Bride of Lammermoor (J. Stuart Blackton, USA, 1909), The Bride of Lammermoor (IT, 1910) Kenilworth (USA, 1909), Lochinvar (based on Marmion, J. Searle Dawley, USA, 1909), Quentin Durward (Albert Capellani, FR, 1911), Rob Roy (Arthur Vivian, UK, 1911), The Lady of the Lake (J. Stuart Blackton, USA, 1912), Guy Mannering (US, 1913), Ivanhoe (Herbert Brenon, UK, 1913), Ivanhoe (Leedham Bantock, UK, 1913), Rebecca the Jewess (based on Ivanhoe, UK, 1913), Rob Roy (O.A.C. Lund, USA, 1913), A Woman”s Triumph (based on The Heart of Midlothian, J. Searle Dawley, USA, 1914), The Heart of Midlothian (Frank Wilson, UK, 1914). Rob Roy (Will Kellino, UK, 1922), Richard the Lion-Hearted (based on The Talisman, Chet Withey, USA, 1923), Young Lochinvar (based on Marmion, Will Kellino, UK, 1924), The Fair Maid of Perth (Edwin Greenwood, UK, 1925), The Lady of the Lake (James A. FitzPatrick, UK, 1926). Ivanhoe (Richard Thorpe, UK/USA, 1952), Rob Roy, the Highland Rogue (Harold French, UK/USA, 1954), King Richard and the Crusaders (based on The Talisman, David Butler, USA, 1954), The Adventures of Quentin Durward (Richard Thorpe, UK, 1955). Redgauntlet (Children’s Hour, 1940, 1945), Guy Mannering (1948), Waverley (1948-49), Ivanhoe (1950), Kenilworth (1950), Quentin Durward (1951), The Talisman (1952), Old Mortality (1952), The Heart of Midlothian (1953), The Fortunes of Nigel (1955), Old Mortality (1974). See H. Philip Bolton, “Sir Walter Scott on BBC,” Scott Newsletter (Issue 12, Spring 1988) 2-9. Kenilworth (UK, 1957), Ivanhoe (39-episode TV series, UK/USA , 1958-59), The Heart of Midlothian (UK, 1966), Kenilworth (UK, 1967), The Devil’s Piper (UK, 1968), Ivanhoe (UK, 1970), The Rebellious Red Gauntlets (UK, 1970), Quentin Durward (France/West Germany, 1971), Woodstock (UK, 1973), The Fortunes of Nigel (UK, 1974), Rob Roy (1977), The Talisman (UK, 1980-81), Ivanhoe (UK, 1982), Ivanhoe (1997), La Jolie Fille de Perth (Fr, 1998). Ballada o doblestnom rytsare Ajvengo (Ivanhoe, Sergei Tarasov, Russia, 1983), Priklyucheniya Kventina Dorvarda, strelka korolevskoy gvardii (Quentin Durward, Sergei Tarasov, Russia, 1988) Richard Ivinoye sedtse (Richard the Lion-Hearted, based on The Talisman, Yevgeni Gerasimov, Russia, 1992), Rytsar Kennet (Kenilworth, Yevgeni Gerasimov, Russia, 1993), Rob Roy (Michael Caton-Jones, USA, 1995). H. Philip Bolton, Scott Dramatized (London: Mansell, 1992), 162, 342, 441. It is also worth asking why the most popular Scott works on the nineteenth-century stage, The Lady of the Lake, Guy Mannering, The Heart of Midlothian, and Kenilworth, slipped into obscurity in the film age. Scott was once commonly characterized as a “man of high genius who was not faithful to his artistic vision”—i.e. a version of the Hollywood sell-out. Donald Carswell, “Sir Walter Scott: A Centenary Commentary,” The Modern Scot 3 (1932). The validity or otherwise of that argument is beyond the scope of this essay. On the endurance of Hugo as an icon of French nationalism, see Stephens, B. “État Présent: Victor Hugo.” French Studies 63, no. 1 (2009): 66-74. Significantly, Bulwer-Lytton, who was extremely sensitive to shifts in public taste, published his first domestic novel, The Caxtons, in 1849 (although he completely gave away historical romance). Dickens, Barnaby Rudge (1841) and A Tale of Two Cities (1859); Thackeray, Henry Esmond (1852); Brontë, Shirley (1849), Gaskell, Sylvia’s Lovers (1863), and Eliot, Romola (1863). If historical fiction was a brief and sometimes unfortunate distraction for the great exponents of the nineteenth-century novel of modern life—as for Wilkie Collins (Antonina, 1850) and Trollope (La Vendee, 1850)—for others, including Charles Kinglsey (Hypatia, 1853), Charles Reade (The Cloister and the Hearth, 1861), and Thomas Hardy (The Trumpet-Major, 1880), it remained vitally important. Sir Walter Scott, The Journal of Sir Walter Scott., ed. W. E. K. Anderson (Oxford: Clarendon Press, 1972) 353. David Daiches, “Scott”s Achievement,” Scott”s Mind and Art, ed. A. Norman Jeffares (Edinburgh: Oliver and Boyd, 1969) 21. Eliot, George. Middlemarch. Edited by W.J. Harvey (Harmondsworth: Penguin, 1965) 25. “Let Dickens and the whole ancestral array, going back as far as the Greeks and Shakespeare, be superfluous reminders that both Griffith and our cinema prove our origins to be not solely as of Edison and his fellow inventors, but as based on an enormous cultured past.” Sergei Eisenstein, “Dickens, Griffith, and the Film Today,” Film Form, ed. Jay Leyda (London: Dobson, 1951) 232. Georg Lukács, “Scott and the Classical Form of the Historical Novel,” Scott’s Mind and Art, ed. A. Norman Jeffares (Edinburgh: Oliver and Boyd, 1969) 99. John Milius, “Reliving the War Between Brothers,” New York Times (6 September 1990, Sect. 2, pp. 1,43) 43. And not just because, as Henry James put it, he had “the same indifference to historic truth as an epic poet.” Hayden, Scott: The Critical Heritage 430. Hayden, Scott: The Critical Heritage 425. Lukács, “Scott and the Classical Form of the Historical Novel,” 98. Lukács, “Scott and the Classical Form of the Historical Novel,” 99. Lukács, “Scott and the Classical Form of the Historical Novel,” 105. The Romantic Movement and the Study of History, The John Coffin Memorial Lecture (London: Athlone Press, 1969) 23. Joep Leerssen, “Literary Historicism: Romanticism, Philologists, and the Presence of the Past,” MLQ (Vol.65, Issue 2, 2004, pp.221-43) 224. Lukács, “Scott and the Classical Form of the Historical Novel,” 117. Friedrich Nietzsche, The Will to Power, trans. Walter Kaufmann, ed. R. J. Hollingdale (London: Weidenfeld and Nicolson, 1968) 438. Leerssen, “Literary Historicism: Romanticism, Philologists, and the Presence of the Past,” 224. See James Chandler, “The Historical Novel Goes to Hollywood: Scott, Griffith, and Film Epic Today,” The Romantics and Us: Essays on Literature and Culture, ed. Gene W. Ruoff (New Brunswick: Rutgers University Press, 1990). London Times (Issue 52566, Tuesday 10 March 1953) 2. Jeffrey Richards, Films and British National Identity: From Dickens to Dad’s Army (Manchester: Manchester University Press, 1997) 187. C.A. Lejeune, Observer, 1 November 1953. Rob Roy, The Highland Rogue is set in the 1710s. B. E., The Highland Rogue: Or, the Memorable Actions of the Celebrated Robert Mac-Gregor, Commonly Called Rob-Roy (London: J. Billingsley, 1723). C. Dixon, Daily Telegraph, 31 October 1953. Lejeune, Observer, 1 November 1953. The Highland Rogue was also, of course, one of Scott’s sources. “Author’s Introduction”, Rob Roy (London: J.M. Dent, 1966), 385. The popularity of Scott’s Scottish novels had first waned during the Victorian medieval revival. See Stephanie L. Barczewski. Myth and National Identity in Nineteenth-Century Britain : The Legends of King Arthur and Robin Hood (Oxford and New York: Oxford University Press, 2000). See also Knights of the Round Table (with Robert Taylor and Ava Gardner, MGM, 1953), The Warriors (with Errol Flynn, Elstree Studios, 1955), The Black Shield of Falworth (with Tony Curtis and Janet Leigh, Universal, 1954), Prince Valiant (with James Mason and Janet Leigh, Fox, 1954), and The Black Knight (with Alan Ladd, Warwick, 1954). Some of these also starred Richard Todd: Disney’s The Story of Robin Hood and his Merrie Men (1952) and The Sword and the Rose (1953). Chandler, “The Historical Novel Goes to Hollywood: Scott, Griffith, and Film Epic Today,” 245. See John H. Lenihan, “English Classics for Cold War America: MGM’s Kim (1950), Ivanhoe (1952), and Julius Caesar (1953)” Journal of Popular Culture and Television (Vol. 20, Issue 3, 1992, pp.42-51), Walter Srebnick, “Re-Presenting History: Ivanhoe on the Screen,” Film and History (Vol. 29, 1999, pp.1-2). Quoted in Jeffrey Richards, Films and British National Identity : From Dickens to Dad”s Army (Manchester: Manchester University Press, 1997) 187. Scott, “Author’s Introduction,” Rob Roy, 385. For instance The Gunfighter (Fox, Henry King, 1950), High Noon (UA, Fred Zinneman, 1952), and Shane (Paramount, George Stevens, 1953). See Sue Harper, Picturing the Past: The Rise and Fall of the British Costume Film (London: BFI Publishing, 1994). George N. Fenin and William K. Everson, The Western from Silents to the Seventies, Revised ed. ed. (Harmondsworth: Penguin, 1977) 307. News Chronicle, 27 October 1953. Brian Woolland, “Rob Roy: Man in the Middle.,” Jump Cut. 43 (2000): 33. Among other Westerns, Sharp wrote The Hired Hand (1971) and Ulzana”s Raid (1972). The latter was adapted from Scott’s account of one Henry Cunningham, a fop of “natural high spirit and daring character” who is said to have bested Rob Roy in a fight over his “supposed effeminacy”. Scott, “Author’s Introduction”, 403. In Barrie’s A Window in Thrums (1889) and other books, Ian Maclaren’s Beside the Bonnie Brier Bush (1894), Ealing Studios’ Whisky Galore! (1949), MGM’s Brigadoon (1954), Compton Mackenzie’s Monarch of the Glen (1941) and its later TV series (2000), and Bill Forsyth’s Local Hero (Goldcrest, 1983). It should be noted that Local Hero follows Whisky Galore! in its affectionate ironisation of kailyard conventions. See following notes. Most notably Ian Maclaren (see below) and Samuel Rutherford Crockett (1860-1914). The story of Barrie’s invention of kailyard is told in Whigham Price, “W. Robertson Nicoll and the Genesis of the Kailyard School,” Durham University Journal (Vol. 86, 1994, pp.73-82). See also George B. Blake, Barrie and the Kailyard School, English Novelists Series (London: Barker, 1951), Eric Anderson, “The Kailyard Revisited,” Nineteenth Century Scottish Fiction, ed. Ian Campbell (New York: Barnes and Noble, 1979) 146, and Richard Cook, “The Home-Ly Kailyard Nation: Nineteenth-Century Narratives of the Highland and the Myth of Merrie Auld Scotland,” ELH (Vol. 66, Issue 4, 1999, pp.1053-73). Maclaren’s real name was the Reverend John Watson (1850-1907). By 1908 Beside the Bonnie Brier Bush “had sold 256,000 copies in Great Britain and 485,000 in the USA” Cook, “The Home-Ly Kailyard Nation,” 1054. Alan Bold, Modern Scottish Literature (London: Longman, 1983) 42. David Daiches, The New Companion to Scottish Culture (Edinburgh: Polygon, 1993) 169. Cook, “The Home-Ly Kailyard Nation,” 1057. Duncan J. Petrie, Screening Scotland (London: British Film Institute, 2000) 3. Scott, 1829 General Preface to Waverley, p.8; “Advertisement” to The Antiquary, p.3. James Kerr, Fiction against History: Scott as Storyteller (Cambridge: Cambridge University Press, 1989) 1. Cairns Craig, Out of History : Narrative Paradigms in Scottish and English Culture, Determinations (Edinburgh: Polygon, 1996) 48. Anderson, “The Kailyard Revisited” 146. Ian Duncan, Modern Romance and Transformations of the Novel: The Gothic, Scott, Dickens (Cambridge: Cambridge University Press, 1992) 152. See also Craig, Out of History, 44-45. For an opposing view, see Carolyn F. Austin, “Home and Nation in the Heart of Midlothian,” SEL: Studies in English Literature 1500-1900 (Vol. 40, Issue 4, 2000, pp. 621-34). Whisky Galore!, for example, may be read in terms of what Colin McArthur calls “the Ealing ethos”: “a detestation of modernity as it related to the city and to the power of capital”: Colin McArthur, “Scotland and the Cinema: The Iniquity of the Fathers,” Scotch Reels : Scotland in Cinema and Television, ed. Colin McArthur (London: BFI Publishing, 1982) 47. Craig, Out of History : Narrative Paradigms in Scottish and English Culture 112. Shown as part of an exhibition at the 1982 Edinburgh Festival. See also Grigor”s photo-essay, “From Scott-Land to Disneyland”, in Colin McArthur, Scotch Reels : Scotland in Cinema and Television (London: BFI Publishing, 1982). Grant Farred, “Wankerdom: Trainspotting as a Rejection of the Postcolonial?”, The South Atlantic Quarterly (Vol. 103, Issue 1, 2004, pp.215-26) 215.